The middle of 2011 was a wonderful period for the Tsalala Pride. With the two daughters of the older tailless lioness each giving birth to a litter of 4 early on in the year, a total of 8 cubs were regularly seen prowling around Marthly. Spending a lot of their time around Ximpalapala koppie and in the Manyelethi riverbed, things were looking good for the pride until we received the sad news that two of the younger litter had been killed by buffalo to the north of our boundary. Starting from the loss of those two cubs, the pride suffered one setback after another, and now only one single sub-adult lioness from the original 8 cubs is left. 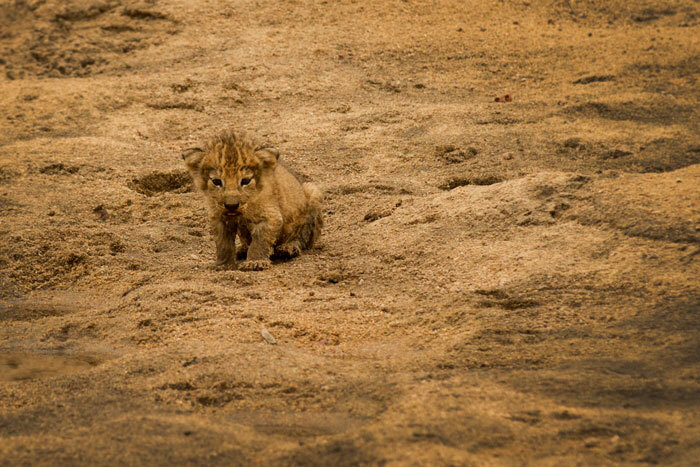 Lion cub mortality is generally high in their first year, but 7 out of 8 lost is a really low survival rate. The evolution of lions into social cats, while partly to do with increased chances of hunting success, has also been shown to increase the protection of young cubs and to increase their chances of survival. 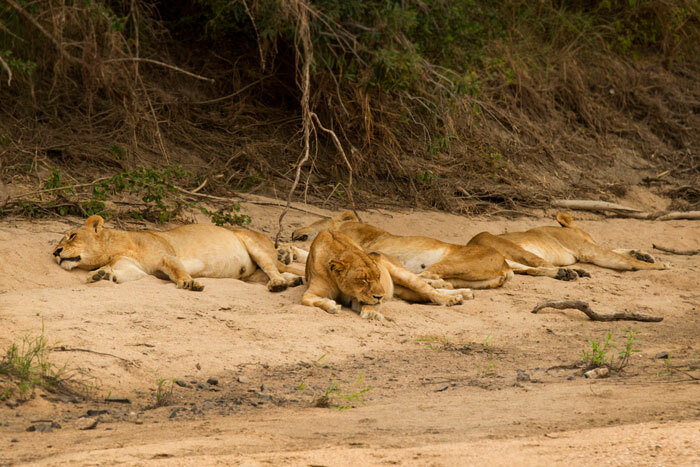 The fact that the Tsalala pride was at the time consitsting of only three lionesses, one of them being very old, may have been a crucial factor in determining how many cubs were going to make it. Recent months have seen all the senior lionesses mating with the Majingilane males. The sub-adult lioness, for reasons unknown to us, is still being chased by these males at every encounter, even though it is their coalition that sired her in the first place. 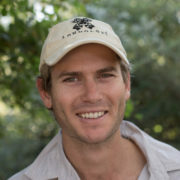 We were wondering if all the mating bouts of the senior members of the pride would result in pregnancy, and then one day ranger Tom Imrie followed the tailed female as she walked up Ximpalapala koppie, and heard the distinctive sound of cubs crying out as the lioness neared a rocky cleft about halfway up the hillside. 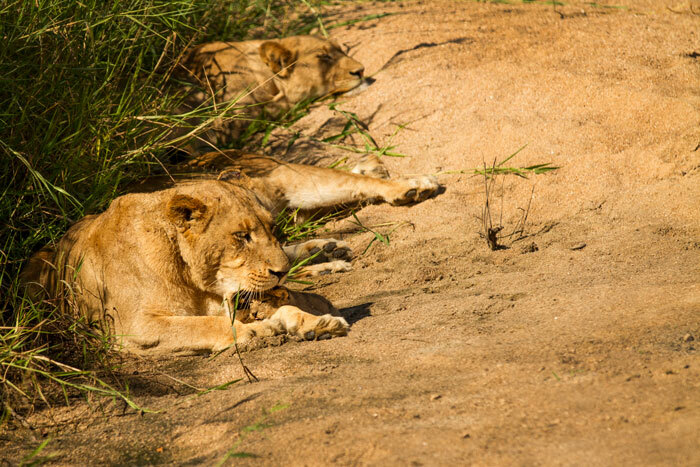 Subsequent visits to the site by rangers revealed at least two cubs there, only just visible when the lioness was present, but to our surprise, within a week of the discovery of the den, the lioness was once more mating with the Majingilane. No more sign of the cubs was seen, and the lioness was not viewed returning to the den. 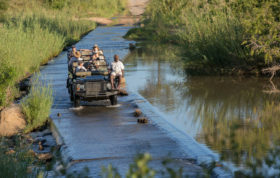 Jump forward about 2 weeks, and ranger Melvin Sambo together with tracker Milton Khoza followed the pride’s tracks to the sandy bed of the Manyelethi river. Imagine their surprise when amongst the large forms of the lionesses, a miniature version was tottering around between them. A single cub, only a few weeks old, was moving around between the lionesses where they lay sleeping. Not fazed by the vehicles presence, such a young cub would usually be far more nervous near a Land Rover. Too be honest, it is probably too small to even know it’s a lion yet! This was over 2 kilometres from Ximpalapala koppie, a distance the cub could never have covered on foot; it would have to have been carried by the lioness. Melvin’s next surprise was to see the little cub suckling from the younger tailless lioness, not the tailed female who had been seen at Ximpalapala. We had known the tailless female to be pregnant but had not had any sign of her giving birth. The pride lies 50 metres away, relatively unconcerned with the fact that the cub is out in the open and vulnerable. Some clouds came over and the cub decided to head back to it’s mother. This is when things started to get confusing. Whose cub was it? 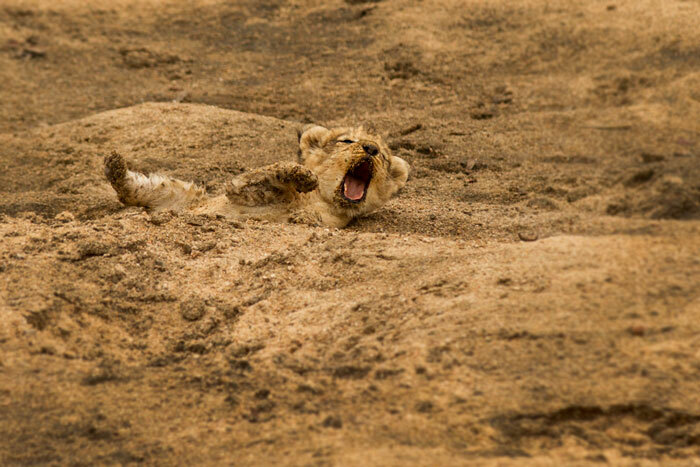 Lionesses are well known to suckle each other’s cubs, but this situation merits far more questions than a simple case of unknown cub maternity. Is this a cub from the Ximpalapala litter? If so what happened to the other one(s) and why has the tailed lioness been mating again? If this cub does belong to the younger tailless female, was there originally only one in the litter, and if so, will she try to raise it? Single lion cubs are usually abandoned by their mothers, as the energy investment required to raise that cub to maturity is just not worth it when the lioness could start again and potentially birth a litter of 5 or 6. We don’t have all the answers. The animals in the bush, despite what you can read in the textbooks, are always keeping us guessing, The Tsalala Pride more than most. All we know is that the cub hasn’t been seen for over a week. 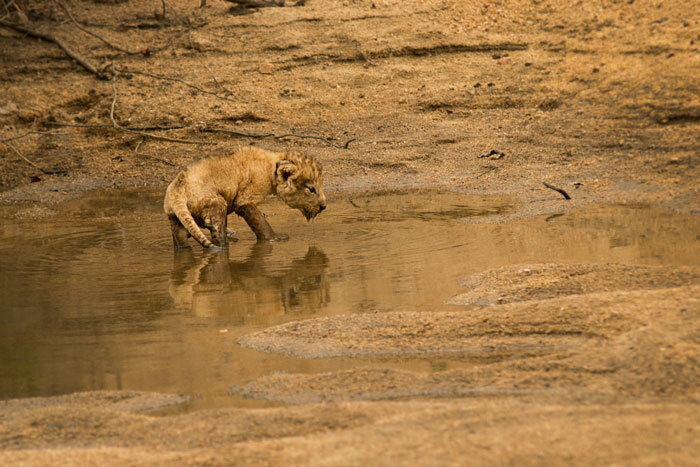 Richard Ferrier and Lucky Shabangu followed tracks of a single lioness and cub slightly upstream in the Manyelethi to a thicket of Matumi Trees, but didn’t approach too closely for obvious reasons. All three of the adult lionesses in the pride have been mating with the Majingilane in the interim, while the sub-adult has once again been seen being chased by the males. One of the cutest things I have ever seen. Hope the little one stays alive, with all the unfortunate mishaps this pride has encountered, they need to foster more of their young beyond the thresh-hold and into adulthood to ensure that they do not become extinct as a pride. I still have hope…their story is in stark contrast to the Sparta Pride at the moment who seem to be flourishing and all of their members have good relations with the domineering Majingilane. Perhaps good relations overall with the dominant coalition is another key to their success..? I had hoped the other sub-adult would have made it this far as well, does anyone know what happened to her…? Unfortunately this was a number of weeks ago and we have every reason to believe she is now dead. Thanks for the photos. The film footage is great. 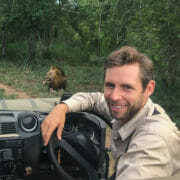 I will be following your updates of the little friend I met at Londolozi. It is a harsh beautiful world they live in. Thank you for sharing this little piece of heaven. I don’t see a good ending to this either, they didn’t seem to take much notice of the little thing at all, most lionesses wouldn’t let them wander so far away, especially at that age ! Was BB there ? 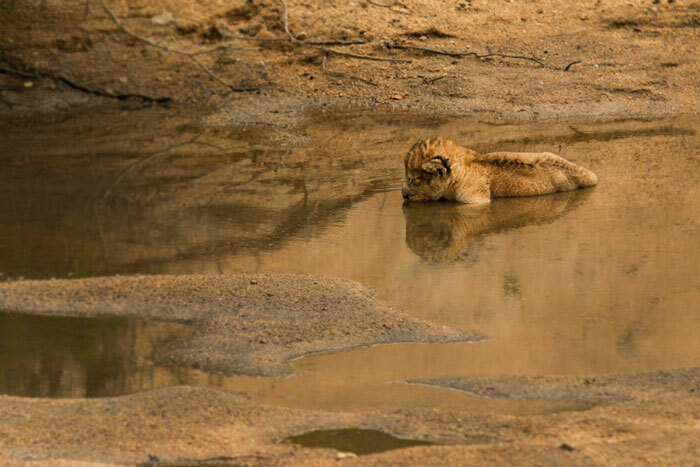 The full pride was in the same place in the Manyelethi riverbed for two days, but on the third day the older tailless lioness was on the Southern side of the Sand River, a couple of kilometres away from the others. Oh how I love the babies! Great pictures and so glad you got video too! I could watch that little one stumble around all day…. Makes me more homesick than I already have been. 🙂 Isn’t he a bit small to be introduced to the pride? His mom cant be the one who was missing from the pride when I was there in Jan, right? Seems like he might be too young to be that cub.